While some small businesses want training on social media best practices for their employees in order to keep that task in-house, other companies prefer for the seasoned social media marketers to do what they know well, and have their online presence managed for them. We approach each client’s social media efforts in the same way we approach our own: to build a targeted audience of engaged users through posting relevant content and interacting with other platform users. Establishing a social media presence is never going to be achieved with 1 tweet or 1 status update a day. Our small business social media management services include a dedicated amount of time spent each day on your small business’ platforms. You’ll always know exactly what you are getting from us. We believe that you are better off doing more with less. We will never pressure you to be all places on the web. For small businesses, you simply cannot be effective if you are spread across 4 or 5 platforms. You’ll be more effective with your social media if you fully maximize 1 or 2 platforms instead of spreading yourself too thin and putting in a minimal amount of effort across more. We aren’t like many other social media firms you’ll find. Here are a few examples of how we are different. We don’t require you to provide content to us in order for us to do our job. We also don’t charge you more if you don’t. Sure, receiving news, updates, photos and the like from a client greatly improves the effectiveness of our social media efforts, but we realize that part of the reason you are hiring us is because you simply don’t have the time and social media knowledge to search for and create content yourself. If you were able to create and curate all the content needed yourself, you wouldn’t need us. 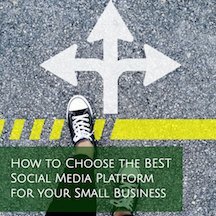 The best mix of social media activities for your small business is not going to be the same as the next small business. This is why we don’t sell pre-determined multi-platform service bundles. Social media won’t work if you treat it solely as a bull horn to endlessly blast promotional updates. It also won’t work if you ignore questions and comments from your customers. We actively work to engage your audience, which builds brand loyalty. Engagement is part of what we do; it should never cost extra. We work with you how you need us to. We can get your small business’ social presence started for you to later take over yourself, we can share social media responsibilities with you on an on-going basis, or we can handle all your social media activity on your behalf. Whatever your needs, we’re happy to accommodate. We will never guarantee 10,000 followers in a few weeks. Why? First, because we believe it’s important to grow your following with active, engaged users who are relevant to your business. Second, because the only way to attain an outrageous number of followers in an extremely short period of time is to buy them, which is against the platforms’ Terms of Service and can get your account shut down. We will never ask you to sign a contract, keep us on retainer or commit to a minimum amount of time. We believe it’s important to give our clients the flexibility they crave, and without these types of restrictions. Our level of social media management can change as your business’ needs do. Because every small business client has their own unique needs and level of desired social media support, our social media management services are “by the hour” and billed every 4 weeks. Clients can utilize our services for a single social media platform, or for several. Also, we can work in tandem with your existing social media efforts if you simply need us to provide some additional updates and interaction on top of what you are currently doing, or share responsibilities by managing the social media platforms you don’t enjoy managing in-house. After discussing your social media needs, goals, and budget, we’ll provide 3 options for ongoing social media management service levels. The specific social media platforms that make the most sense for your business often depend upon your specific industry, customer base, and other marketing assets we have to work with. We are happy to discuss the pros and cons of implementing platforms like: Facebook, Twitter, Pinterest, LinkedIn, Google My Business, Instagram and YouTube. To read about our platform-specific monthly social media management services, please visit our Twitter Management, Facebook Management, Pinterest Management, Instagram Management, LinkedIn Management, Google My Business Management, and YouTube Management pages. Read more about our Social Media Profile Creation service here.